Modern life's all about getting everything you need in one place -- why, in today's shopping centers you'll find wares as diverse as wonderful-smelling candles, sportswear, and any and all resources needed to fight off zombie outbreaks for the 83 minutes it takes the army to show up. 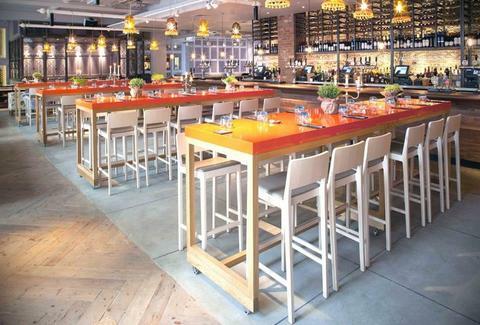 Supplying all your casual consumption needs under one roof: The Anthologist. Opened yesterday, this two story operation incorporates a bar, deli, cocktail lounge, kitchen, and basement wine cellar, with both on/off licenses; the spacious, open-plan space has several "flexible", dark teak-floored lounge areas with comfy armchairs and dome lighting, while the bar itself features exposed brickwork, cabana-style tables, and tall seating for "more social drinking", even though it's the tall drinks that're facilitating that socializing. Beyond beer and wine, the bar slings cocktails including the "Kunsei Treacle" (Pampero Aniversario rum w/ sugar, bitters, apple), "The Botanist" (Tanqueray w/ cucumber, ginger syrup, lemon juice, black pepper, fresh basil leaves), and the 4-person, jar-served, Pampero Especial-fueled "Island Mango", one of their "Signature Punches" -- down it solo, and you'll feel like you've received one of Tyson's (or Bruno's. Go Britain!). Those eating in can also snag dishes such as a sticky bbq glazed pork burger w/ beer-battered onion rings, a fish finger sandwich on bloomer w/ homemade tartar sauce, and citrus-soy prawn & lemongrass "lollipops" -- a nod to an NYC meat = sweets trend that, if there is a god, will end with you sucking eternally on a Ham Gobstopper. The deli's stocked with Borough Market fare such as Neil's Yard cheese, Flour Station bread, and Allen's of Mayfair ham, while the cellar has fine wines to stay or go, including Domaine De Vieux Telegraphe Chateauneuf Du Pape, and Les Perrieres Nuit-St-Georges -- who was wonderful against dragons, but if you're heading to Westfield, better order the "St Romero".